We can proudly announce that we have been granted the “10 PPM Award” by PACCAR / DAF. This is a trophy which PACCAR / DAF presents to suppliers that obtain a quality level of 10 PPM (Defect Parts per Million) or less. As we supply over 200 different parts for PACCAR / DAF, with a total number of 2.2 million parts delivered in 2016, this truly is an accomplishment we are very proud of as a company. 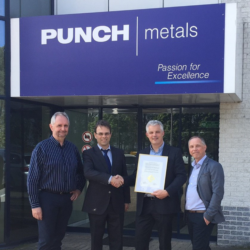 “We should also give credit to suppliers like Punch Metals NV for the quality delivered by DAF, Kenworth and Peterbilt trucks”, said Paccar / DAF. To us, this kind of appreciation is a very good motivation to keep our quality level this high.